“The injustice of the unreturned looted art, real estate, and bank accounts perpetuates Nazi treachery for countless families six decades after the end of World War II. 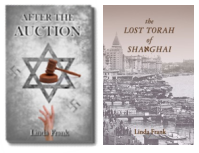 It’s an aspect of Holocaust history that has intrigued me for years,” says author Linda Frank. That intrigue led Frank to write her newest novel, After the Auction, a story replete with danger, romance, and a half-century of secrets. Set in 1990 before the surge of publications and publicity about lingering injustices of unreturned art fostered museum policy shifts and the establishment of global registries, After the Auction plunges readers into the quagmire journalist Lily Kovner faces after she catches a glimpse of the antique Seder plate she hasn’t seen since it was stolen by the Nazis fifty-two years earlier. Lily’s quest to reclaim the Seder plate takes her on a geographic journey from New York City to London and Israel, as well as a journey back to historic but tumultuous times in her own life and in the life of the Jewish people. Persevering despite threats and the murder of an important source, she ultimately uncovers a shocking tale of betrayal and duplicity. Along the way her budding romance with Simon Rieger provides more than a pleasant diversion, as Simon proves to be a critical ally. Making its debut at Book Expo America, After the Auction was also selected to be featured as part of the Jewish Book Council’s Jewish Book Network. — Jonathan Petropoulos, John V.
After the Auction is the first novel by Linda Frank, a prolific columnist, blogger, and book reviewer. For more information please visit www.lindafrankbooks.com. After the Auction is available for purchase on Linda’s web site, Amazon.com, Barnesandnoble.com and by order at independent book stores through the Ingram or Baker & Taylor catalogues.